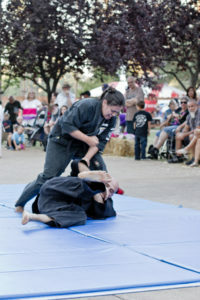 Grass Valley Kenpo Family Karate offers FREE women’s self defense workshops once a month. We here at Grass Valley Kenpo feel that no one has the right to put their hands on you and every woman has the right to defend themselves when put in danger. You should feel safe when walking down the street, not having the anxiety and fear of having to constantly look over your shoulder. We feel that the need for education in awareness and self defense is critical now more than ever. We know that martial arts dojos can be bastiens of testosterone, with sweating burly men fighting and wrestling. We’ve tried to move away from all that, fostering a welcome safe place for women to encourage other women. We have all female instructors, trained in self defense, who want to help you gain the knowledge and skills needed to make you more confident. 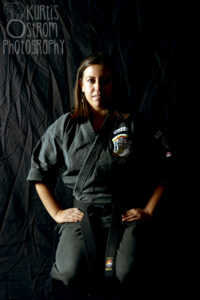 Jakki Garcia is a 4th degree black belt in the art of Kenpo Karate, and our head women’s self defense instructor. She has over 20 years experience teaching and training in the martial arts. She is currently the Combative Self Defense professor at the Nevada County campus of Sierra College. 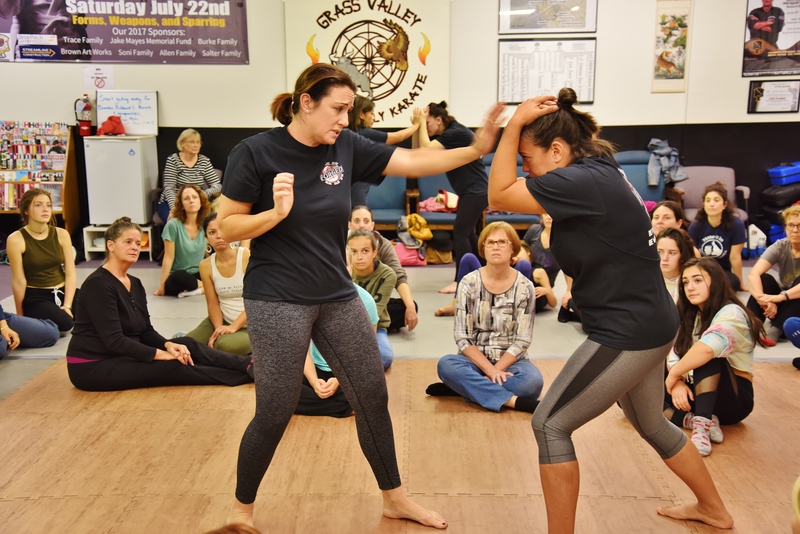 She is also an ICSU certified level 1 Krav Maga instructor and an instructor with The Warrior Forged Project, a group of all female instructors who travel around the country teaching free self defense seminars. Learn more about The Warrior Forged Project here. Absolutely not! Our workshops are completely FREE. It is so important that finances should not be the deciding factor between living in fear and living with confidence. No. We will teach you the most basic of movements while you become comfortable with your body. Can I bring my daughter? She's only 8 years old. Yes. Our minimum age is 8 years old. This is due to the subject matter occasionally discussed. My husband wants to learn self defense too! What about him? We offer the self defense art of Kenpo Karate to everyone. He is welcome to take Kenpo classes. Our self defense workshops are for women only. No. You don’t need to buy anything. Just come as you are. Wear something comfortable that you can move in. I do not want to get hurt. Are we going to be fighting? This is self defense. Not MMA. While we will be practicing our techniques on each other, every care will be taken for your safety. It is our number one priority. Am I too old to be taking self defense classes? It’s never too late to learn! Our workshops are low impact and designed for all abilities. That sounds amazing! Where do I sign up? Our workshops are scheduled once a month on Saturdays. Check our calendar or Facebook page for updates. No need to pre-register; just come on in!